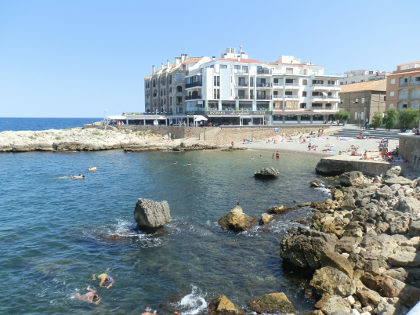 L'Escala is an old fishing town, famous for its anchovies, with a modern residential area of holiday homes and villas that extends out towards the base of Montgri to the south, with a coastline that extends up to the ruins of Empuries to the north. In the last few years, much of the sea front of the main old town has been renovated with plazas and piazzas and renewed town beaches and lots and lots of restaurants, together with increased pedestrianisation making for a very pleasant setting. In practice there are two main beach areas for L'Escala town - those by the town which consist of 2-3 small pebble beaches (depending on how you count them) plus a grit-type sandy central beach. And secondly, the beach to Riells which is much larger with finer sand. We've also covered the beaches just outside town, up around Empuries and Sant Marti d'Empuries, and we've also covered the beach at Cala Montgo, so this is the chance to fill the gap. If you are on holiday here then, there are quite a number of options for different beach areas. 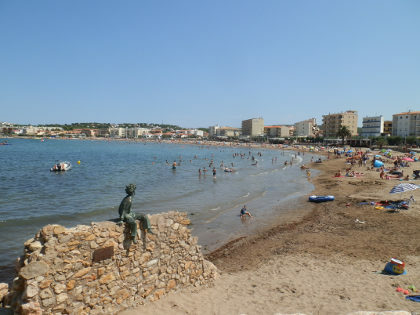 The town beaches consist of small calas. 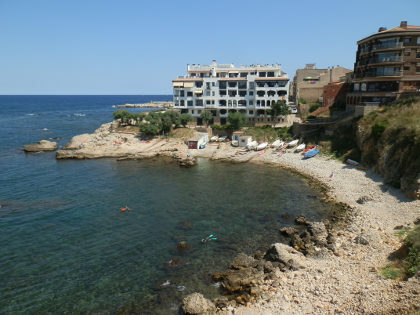 If you're coming from the Empuries direction you'll see one or two (depending on how you count them) small undeveloped pebble beaches that sit under the cliff with fishing boats that attract a handful of snorklers, then comes the main refurbished town beach, and then, past the headland, a further small pebble beach. The main town beach looks out to an island in the bay, which is within easy swimming distance. We swam in the sandy town beach for this visit. As everything is relatively newly done, the sand still feels like the reclaimed sand, which then runs into the bay itself, so it doesn't feel completely natural, though further out the bay itself becomes more rocky. The beach shelves gently, and actually the whole of the bay is relatively shallow - though still deep enough so as not to be able to touch the bottom. In summer they have a swimming platform in the bay which attracts lots of children. And in principle, with older children, it would be possible to sit in one of the very many bars and restaurants at the back of the beach, while watching your children on the beach and in the water. Being a town beach, it does have lifeguards. The sand is gritty. The pebble beaches don't have sand. The water was very clear for our visit, but felt shallow. It's easily possible to swim along the bays, but the depth is low in places. Alternatively to swim to the island, but for longer swims you'd probably go more to Montgo or Empuries area. 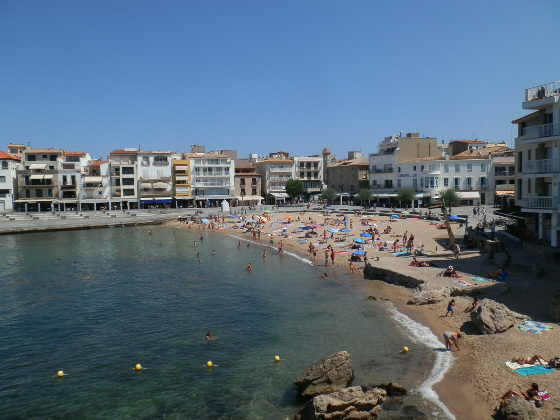 There are dedicated parking area for the town beaches as you come into town from the Empuries direction, plus some supermarkets where it might be possible to park if everything else is too busy. Riells beach is the largest beach in L'Escala approximately 2km from the old town seafront on an easy stroll along the bay. Because of the fine sand, it tends to attract a lot of families and feels much more touristy. At the back of the beach is a boardwalk/esplanade with a range of souvenir shops plus bars and restaurants, and a number of the restaurants have terraces over the beach itself. To one end is a small amusement park. Unlike the centre of town it feels much more seasonal (and out of season, the sand drifts onto the boardwalk) and has a slightly tacky feel - though better class bars have been appearing more recently. We haven't swum here yet, but the bay looks gently sloping, and we have seen jet-skiers coming out of the port to the right of the beach. Empuries and Montgo have areas to explore. L'Escala itself, in the middle, is white holiday homes and residential and not particularly exciting for exploring on foot away from the old town.